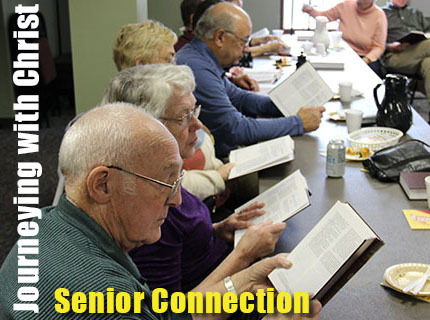 The Senior Connection is young at heart and spry here at Divine Redeemer with a strong and active group meeting every Thursday at 9:30 AM for Bible study and fellowship, as well as special events throughout the year. Many of us come early on Thursdays to volunteer our time and talents as needed. The ministry that the Senior Connection provides reaches far beyond the Fellowship Hall at Divine Redeemer. We are active in social functions, attending several plays, concerts, Christian comedies, dinner shows, and luncheons, as well as generously donating goods and services for service men and women overseas, Operations Christmas Child, the Apple Pie event, and the Giving Heart Fund. Each week, we come together to hear God’s Word. Our three Divine Redeemer pastors share the responsibilities of leading us in Bible study, guiding us through the scriptures and providing a wealth of Biblical knowledge, as well as encouragement and laughter. Join us - you are always welcome.